Since 1977 the Madison Area Health Center has been serving the Madison and surrounding communities. At our health center, the top priority is the wellbeing of our patients while utilizing the most up-to-date knowledge and technology. Click here to learn more and to watch a video: Patient-Centered Medical Home. Our staff includes a team of physicians, behavioral health specialists, a psychiatric mental health nurse practitioner, as well as clinical and administrative support staff. With our team, we are able to offer a variety of services based on the needs of our patients. 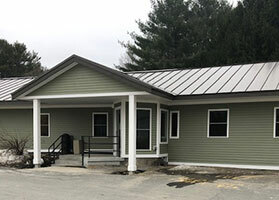 If outside hospital services are needed, our providers maintain a strong relationship with Redington Fairview General Hospital in Skowhegan. Located along the Kennebec River, Madison resides in the foothills of Maine’s western mountains. Madison is dedicated to building community through projects such as the Madison Community Garden and the Madison Tree Program. Opportunities for recreation are plentiful throughout the seasons. Residents and visitors enjoy fishing, river paddling, biking, camping, snowmobiling, cross country skiing, and snowshoeing. In the summer months, the Lakewood Theatre is open for exciting productions. We offer Same-Day Appointments: simply call in the morning to schedule an appointment for that same day!